Public Member Tree, online search.ancestry.com, Amelia's Family Tree. David Mattice household, 1850 U.S. Census, Schoharie County, David Mattice, population schedule, Wright, dwelling 4B, family 49, age 58, occupation Farmer. John J. Mattice household, 1850 U.S. Census, Schoharie County, John J. Mattice, population schedule, Wright, dwelling 2A, family 15, age 60, occupation Farmer. David Mattice household, 1850 U.S. Census, Schoharie County, David Mattice, population schedule, Wright, dwelling 4B, family 49, age 59, occupation Farmer. Peter Mankins household, 1870 U.S. Census, Washington County, Peter Mankins, population schedule, White River, dwelling 278A, family 85, age 56, occupation Farmer. Peter Mankins household, 1850 U.S. Census, Washington County, Peter Mankins, population schedule, White River, dwelling 355B|69, family age 72, occupation Farmer. Peter Mankins household, 1840 U.S. Census, Washington County, Arkansas, population schedule, Line Number, 255. Peter Mankins household, 1860 U.S. Census, Washington County, Peter Mankins, population schedule, White River, dwelling 772, family 66, age 85, occupation Farm. Reminiscences of Bygone Years - by Zachariah Van hoose - 1823-1827, online www.jeanhounshellpeppers.com/Memories_by_Zachariah_VanHoose. Walter Mankins household, 1840 U.S. Census, Washington County, Arkansas, population schedule, Line Number, 255. Rootsweb Worldconnect Family Trees, online wc.rootsweb.ancestry.com, Sullivan and Beyond - Margaret Lemke. Larkin Cantrell household, 1850 U.S. Census, Franklin County, Illinois, population schedule, Unstated, dwelling 4, family 52, 52. Richd Cantrell household, 1840 U.S. Census, Franklin County, Illinois, population schedule, Line Number, 193. Richard Cantroll household, 1820 United States Census, Franklin County, Illinois, population schedule, Line Number, 32. Richd Cantrell household, 1840 United States census, Franklin County, Illinois, population schedule, Line Number, 194. Bethel Cantrell household, 1850 U.S. Census, Franklin County, Illinois, population schedule, Unstated, dwelling 4, family 52, 52. Ancestry.com OneWorldTree For Robert Rutherford and Mary Dobbin, online search.ancestry.com. U.S., Sons of the American Revolution membership Applications, 1889-1970, photocopy at Ancestry.com, online search.ancestry.com, Membership application of Geo Rust, Salt Lake City, Utah. Son of Armistead T.M. Rust and Ida Lee; Grandson of Edmund Jennings Lee and Henrietta Bedinger; great-grandson of Daniel Bedinger and Sarah Rutherford; great-great-grandson of Robert Rutherford and Mary Daubine (widow of Jno. Augustus Howe). Rootsweb Worldconnect Family Trees, online wc.rootsweb.ancestry.com, Davis Lewis Lord Wills - Contact: Elizabeth D Hanebury(See RootsWeb). Find A Grave - Memorial Page, online www.findagrave.com, Elizabeth Conrad Bedinger Washington - Find A Grave Memorial# 65819764. Public Member Tree, online search.ancestry.com, Avis's Family - agoldpenny1 "Evangelische Kirche Wronke, Kirchenbuch, filmed by Salt Lake City:Genealogical Society of Utah, 1971. Film #0764499.". Public Member Tree, online search.ancestry.com, Avis's Family - agoldpenny1 "Evangelische Kirche Wronke, Kirchenbuch, filmed by Salt Lake City:Genealogical Society of Utah, 1971. Film #0764498.". S Davis household, 1860 U.S. Census, Yalobusha County, S Davis, population schedule, N.E. Beat, dwelling 796, family 399, age 58, occupation Farmer. Rootsweb Worldconnect Family Trees, online wc.rootsweb.ancestry.com, Ancestors of Jenny McManus - Updated: 2012-01-30; Sources: "Yalobusha Bound" by Chris Morgan; LDS Family Search and GenCircles Search of "Ancestors of Sarrell Duane Robinson." Rootsweb Worldconnect Family Trees, online wc.rootsweb.ancestry.com, Kerr - Some of the sources quoted are 1) Cornelius Bible Reocrd, "Alabama Records, Blount Co.", Volume 245; "Genealogy of the Bynum Family", Volume two, by Mary Lou Boazman Howard and "William Cornelius", by Bruce A. Jordan. Other information extracted from Family Tree Maker's World Family Tree, Vol. 13 and Family Tree Maker Family History: Souther Genealogies #1, Historical Southern Families, Vol. XXII, page 48. Rootsweb Worldconnect Family Trees, online wc.rootsweb.ancestry.com, "Kerr." Find A Grave - Memorial Page, online www.findagrave.com, Memorial# 21665344 - readable head stone located in the Airmount Cemetery, Benwood, Yalobusha County, Mississippi. R. J. Murphree household, 1850 U.S. Census, Yalobusha County, R. J. Murphree, population schedule, North of the Yallabusha River, dwelling 381B, family 68, age 42, occupation Planter. Public Member Tree, online search.ancestry.com, My Family Tree/Guthrie,Alexander,Brooks,Ferguson - LaquethaG. Find A Grave - Memorial Page, online www.findagrave.com, Roxy Stevens Campbell - Find A Grave Memorial# 133479941. Ezekiel Hearlson household, 1850 U.S. Census, Grant County, Wisconsin, population schedule, Eastern District, dwelling 226A, family 428, 428. Find A Grave - Memorial Page, online www.findagrave.com, William Harrelson - Find A Grave Memorial# 103245855. Eikle Harilson household, 1810 United States Census, Warren County, Kentucky, population schedule, Line Number, 247. Ezekiel Harelson household, 1860 U.S. Mortality Census, Grant County, Wisconsin, population schedule, Line Number, 4. Zekiel Harlstan household, 1860 U.S. Census, Grant County, Wisconsin, population schedule, Lancaster, sheet 350, dwelling 1030, family 1015, age 31, occupation Miner. Find A Grave - Memorial Page, online www.findagrave.com, Elijah Harelson - Find A Grave Memorial# 22154688. Find A Grave - Memorial Page, online www.findagrave.com, John BurgessHarelson - Find A Grave Memorial# 25119657. Rootsweb Worldconnect Family Trees, online wc.rootsweb.ancestry.com, St. Croix Valley Roots: Updated: 2013-04-18 20:11:56 UTC - Reference at http://www.nbgs.ca/ under First Families. RootsWeb's World Connect Project - Global Search, online wc.rootsweb.ancestry.com, Remembering Our Ancestors - Carol Change Date: 17 Feb 2010. Robert Gorham household, 1860 U.S. Census, Wyandot County, ohio, population schedule, Upper Sandusky, sheet 394, dwelling 672, family 672, age 28, occupation Farmer. Public Member Tree, online search.ancestry.com, Owner: James Linder; Unsorced. Public Member Tree, online search.ancestry.com, Posted 4 Jan 2014 by laveld. Sumner Frost household, 1860 U.S. Census, Oxford County, Sumner Frost, population schedule, Norway, dwelling 615, family 283, age 55, occupation Farmer. Massachusetts, Deaths, 1841-1915 at Family Search, online familysearch.org, FamilySearch (https://familysearch.org/pal:/MM9.1.1/NW93-JR2 : accessed 26 May 2014), Summer Frost, 05 Aug 1885; citing Lynn, Massachusetts, v 364 p 254, State Archives, Boston; FHL microfilm 960228. Abial Frost household, 1850 U.S. Census, Oxford County, Abial Frost, population schedule, Albany, dwelling 30B, family 39, age 77, occupation Farmer. Dodd, Jordan, Liahona Research, comp.. Massachusetts Marriages, 1633-1850 [database on-line]., online http://www.ancestry.com, Source: Family History Library, Salt Lake City, UT, Film # 0874027 item 4. Public Member Tree, online search.ancestry.com, Griffin and Junge: See story for Dolly H. Frost. Maine, Birth Records, 1621-1922 viewed at Ancestry.com, online search.ancestry.com, Maine State Archives; Cultural Building, 84 State House Station, Augusta, ME 04333-0084; Pre 1892 Delayed Returns; Roll #: 39. Maine, Birth Records, 1621-1922 viewed at Ancestry.com, online search.ancestry.com, Maine State Archives; Cultural Building, 84 State House Station, Augusta, ME 04333-0084; Pre 1892 Delayed Returns; Roll #: 40. 1889-1970. Louisville, Kentucky: National Society of the Sons of the American Revolution Sons of the American Revolution Membership Applications, John Franklin Armstrong, Membership Number: 81581, Viewed at Ancestry.com. Hannah Weeks household, 1850 U.S. Census, Prince William County, Hannah Weeks, population schedule, County, dwelling 115A, family 285, age 77, occupation None Listed. William Weeks household, 1860 U.S. Census, Prince William County, William Weeks, population schedule, Prince William County, dwelling 463, family 312, age 55, occupation Farmer. William Weeks household, 1850 U.S. Census, Prince William County, William Weeks, population schedule, County, dwelling 115A, family 28, age 73, occupation Shoe Maker. LDS, Family Search, IGI Individual Record, online https//familysearch.org, Agatha Haitz, Wumersheim,Baden, Baden. Jane Young was born on 31 March 1773 at Sullivan County, Tennessee.1 She married Abraham Pallette before 1796 at Tennessee.3 Jane Young died on 18 October 1851 at Missouri at age 78.1 She Posted at Find-A-Grave "Jane was the daughter of James Young and Elizabeth Long in what is today Sullivan Co., TN. Her father died when she was only a toddler in the Revolutionary War". "Jane had the following siblings: Mary (Young) Campbell, Anna (Young) Laughlin, Joseph Young". "Jane owned land in Rutherford/Cannon Co., TN. & Jackson Co., MO. 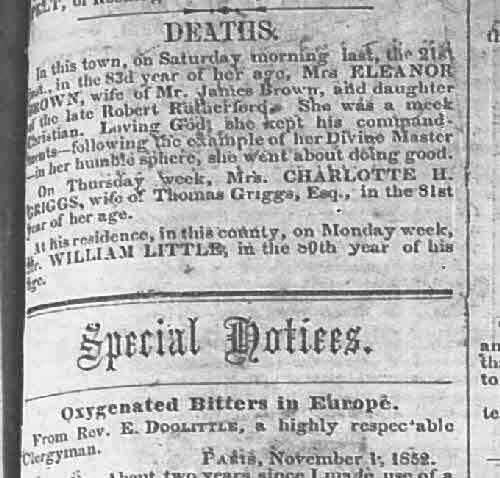 She died at the Lafayette Co., MO. home of her daughter, Nancy Agnes (Pallette) Dickenson on Oct. 18, 1851 (her tombstone reads 1852, however her obituary is in the November 13, 1851 issue of the 'Nashville Christian Advocate, a Methodist Publication'). Further her tombstone shows her surname without the last 'e' ". Find A Grave, database and immages, online www.findagrave.com, Thomas Armstrong "Armstrong" Pallette, Find A Grave Memorial no: 19272196. Find A Grave, database and immages, online www.findagrave.com, Jane Young Pallette, Find A Grave Memorial no: 19272186. Find A Grave, database and immages, online www.findagrave.com, William Pallette, Find A Grave Memorial no: 19272187. Find A Grave - Memorial Page, online www.findagrave.com, Ibzan Middlebrook - Find A Grave Memorial# 94010195. Find A Grave - Memorial Page, online www.findagrave.com, Joseph Middlebrook - Find A Grave Memorial# 30891368. J.Y. Kelly, "Kelly Of Westmoreland Co. Virginia", p. 130. John K. Gott, Fauquier County Virginia Marriage Bonds: 1759-1854 AND Marriage Returns: 1785-1848, p.113. Find A Grave, database and immages, online www.findagrave.com, Aevas Beard Wood, Find A Grave Memorial no: 96840076. Find A Grave, database and immages, online www.findagrave.com, Jarrett Wood, Find A Grave Memorial no: 96839997. Hannah Parr household, 1830 United States census, Culpeper County, Virginia, unknown county, unknown st, population schedule,Page: 92, Line Number 18 ,Viewed on Ancestry.com. Hannah Parr household, 1850 U.S. Census, Culpeper County, Virginia, population schedule, Township Unstated, dwelling 271, family 863, 863. William Parr household, 1850 U.S. Census, Culpeper County, Virginia, population schedule, Township Unstated, dwelling 89, family 652, 652. William Graves household, 1850 U.S. Census, Orange County, Virginia, population schedule, Not Stated, dwelling 227, family 178, 178. Ancestry.com: Fridley, Beth. Culpeper County, Virginia Deaths, 1854 - 1879 [database on-line]. Provo, UT, USA: Ancestry.com Operations Inc, 2001. Original data: Library of Virginia, Richmond, VA., online http://www.ancestry.com, Name: Isabella McNEALE; Death Date: Apr 1857; Cause of Death: OLD AGE; Age (Years): 83; Father: William Farrow; Mother: Ann; Place of Birth: Culpeper. Public Member Tree, online search.ancestry.com, Richart Family Tree: Sourced. Find A Grave - Memorial Page, online www.findagrave.com, Susan Harrison Slaughter Caldwell - Find A Grave Memorial# 46565746. Find A Grave - Memorial Page, online www.findagrave.com, James Logan Caldwell - Find A Grave Memorial# 46565742. Olie C. Tollefson household, 1930 U.S. Census, McKenzie County, Olie C. Tollefson, population schedule, Twin Valley, ED 0038, sheet 4B, family 71, 90. Jefferson County Historical Society, Zion Episcopal church burial records, Zion Episcopal Cemetary. Jordan R. Dodd et. al., Early American Marriages: Virginia to 1850. 1810 US Census, James Brown: 3 1 - 1 - ; 1 - - 1 1 1; 8.
females: (to10) 1, (16 to 36) 1, ( 45+) 1. 1 female 50 to 60. John P. Brown household, 1850 U.S. Census, Jefferson County, Virginia, population schedule. Katherine Glass Green, Winchester, Virginia, and its beginnings, 1743-1814 : From its founding by Colonel James Wood to the close of the life of his son, Briadier General and Governor James Wood, with the publication for the first time of valuable manuscripts, relics of their long tenure of public offices., page 381. Jefferson County Historical Society, Zion Episcopal church burial records, p. 357. Editor, "See Surname", p. 428. Information provided by Mr W. A. Towles of Henderson, Ky.
Find A Grave - Memorial Page, online www.findagrave.com, Elizabeth Towles Slaughter - Find A Grave Memorial# 112844903. 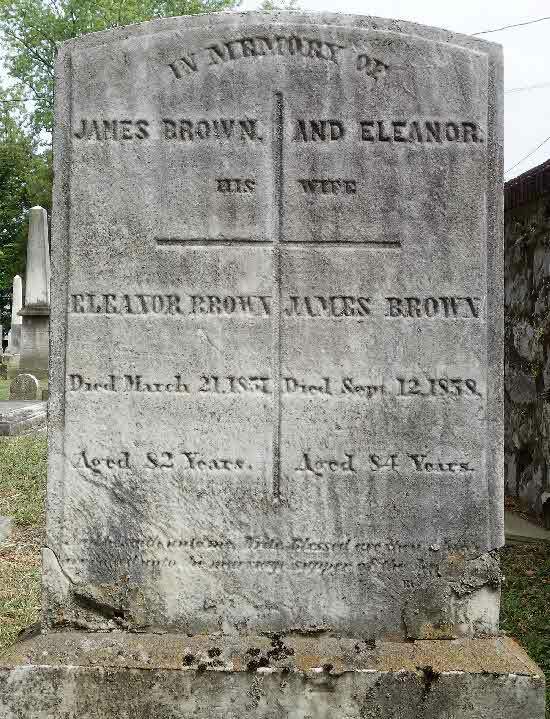 Find A Grave, database and immages, online www.findagrave.com, Eleanor Rutherford Brown, Find A Grave Memorial no: 22935710. Post 1991 IGI - Member Record, "LDS Online Family Search", Ancestral File. England Marriages, 1538-1973 Viewed at FamilySearch, online familysearch.org, FamilySearch reference: Indexing Project (Batch) Number: M13850-5; System Origin: England-EASy; Source Film Number: 1040590. Wisbech and the Fenlands, Al list of Persons residing in the parish of Leverington(1798). The Wisbech Index (Established on the 10th of May 2001 by Alan Gresley, online http://www.contueor.com/wisbech/parishes/leverington/…, Pratt's included include: Charles - Butcher, Uriah - Butcher, Widow - Servant and William - Farmer. Parish Records Collection - burial; viewed at findmypast.co.uk, online www.findmypast.co.uk, Record Source: Cambridgeshire Burials; Data Provider: Cambridgeshire Family History Society. Parish Records Collection - baptism, viewed at findmypast.co.uk, online www.findmypast.co.uk, Charles Pratt, son of Uriah and Mary. Bland County Centennial Corporation, History of Bland County (Virginia), Page 135. Samuel Steel household, 1820 United States Census, Whitley County, Kentucky, population schedule, Line Number, 126. Clayton R. Cox, "Whitley County, Kentucky Will Book No. 1 1818-1854", Part 1, Page 35. Clayton R. Cox, "Whitley County, Kentucky Will Book No. 1 1818-1854", Page 7. Carl Edmond Steele, STEELE - A Gathering Of The Clan, Page 21. Unknown name of person unknown record type, unknown repository, unknown repository address. Sarah Curch Household, Doddington, Cambridgeshire, 1841 Census Returns of England and Wales , Piece: 81 , Folio: 7 , Page: 8 GSU roll: 241228. Unknown name of person unknown record type, unknown repository, unknown repository address, Daughter of Wm & Elisabeth, age 14. Cambridgeshire Family History Society online Searchable Databases - Cambridgeshire Baptism Index 1801-37, online www.cfhs.org. John Robson household, 1810 U.S. Census, Culpeper County, Virginia, population schedule, Line Number, 109. Jno Robertson household, 1830 United States census, Culpeper County, Virginia, unknown county, unknown st, population schedule,Page: 73, Line Number 1 ,Viewed on Ancestry.com. James Parr household, 1820 United States Census, Culpeper County, Virginia, population schedule,Page: 257, Line Number 38 ,viewed on Ancestry.com. James Parr household, 1820 United States Census, Culpeper County, Virginia, population schedule,Page: 257, Line Number 38| Only Parr in Culpeper County ,viewed on Ancestry.com. Find A Grave - Memorial Page, online www.findagrave.com, Williaml Harelson - Find A Grave Memorial# 103245855. Peter Huckleberry household, 1850 U.S. Census, Washington County, Peter Huckleberry, population schedule, Gibson, dwelling 409A, family 105, age 75, occupation Farmer. William Huckleberry household, 1850 U.S. Census, Washington County, William Huckleberry, population schedule, Gibson, dwelling 409A, family 105, age 30, occupation Farmer. James Sommerville household, 1850 U.S. Census, Culpeper County, Virginia, population schedule, Culpeper County, dwelling 243B, family 426, 426. Public Member Tree, online search.ancestry.com. Richard Cannon household, 1850 U.S. Census, Monongalia County, Virginia, population schedule, District 37, dwelling 332, family 485, 486. John Dievendorff household, 1860 U.S. Census, Montgomery County, John Dievendorff, population schedule, Minden, dwelling 385, family 1107, age 85, occupation Farmer. John Dievendorf household, 1850 U.S. Census, Montgomery County, John Dievendorf, population schedule, Minden, dwelling 236, family 438, age 75, occupation Farmer. Jarsha Steel household, 1830 United States Census, Whitley County, Kentucky, population schedule, Line Number, 273. Cynthia R. Pratt, "Cynthia's Notes", "Gram." Griffith Dickerson household, 1850 U.S. Census, Jackson County, Missouri, population schedule, Sni-A-Bar, dwelling 337A, family 1447, 1447. Family Search - International Genealogical Index. Ancestral File is a collection of genealogical information taken from Pedigree Charts and Family Group Records submitted to the Family History Department since 1978. The information has not been verified against any official records., online www.familysearch.org/Eng/Search/frameset_search.asp,For Pedigree Resource File; Sumitter: John Slayton, Independence, MO; Compact Disc #8. Bonnie S. Ball and Vivian D. Bales, The Dickenson Families of England & America: Dickinson, Dickerson, Dickson, Dixon, etc, p 83. 1840 US Census, Griffith Dickerson. Compiled by Lois Stanley George F. Wilson and Maryhelen Wilson, Death Records From Missouri Newspapers January 1854 - December 1860. Mary Ellen Thompson Saxon, "LDS Online Family Search", Ancestral File, (AFN: 1G1Z-VGG) Griffith Dickerson. Bonnie S. Ball and Vivian D. Bales, The Dickenson Families of England & America: Dickinson, Dickerson, Dickson, Dixon, etc, Pages 83-84. Bonnie S. Ball and Vivian D. Bales, The Dickenson Families of England & America: Dickinson, Dickerson, Dickson, Dixon, etc, Page 83. Bonnie S. Ball and Vivian D. Bales, The Dickenson Families of England & America: Dickinson, Dickerson, Dickson, Dixon, etc. Nancy Dickerson household, 1850 U.S. Census, Jackson County, Missouri, population schedule, Sni-A-Bar, dwelling 336B, family 1442, 1442. Oct. 1850. household, 1860 U.S. Census, Jackson County, Missouri, population schedule, sheet unknown cd3. "Maine, Births and Christenings, 1739-1900," index, FamilySearch, online familysearch.org, (https://familysearch.org/pal:/MM9.1.1/FWBY-63P : accessed 18 Mar 2014), Hannah Sevey, 06 Apr 1775; citing ; FHL microfilm 11562. 1820 United States Census, Culpeper County, Virginia, Jno Robson. Jno. Armstrong household, 1810 U.S. Census, Culpeper County, Virginia, population schedule, Line Number, 76. War of 1812 Pension Application Files Index, 1812-1815 [database on-line]. Provo, UT, USA: Ancestry.com Operations Inc, 2010. Original data: War of 1812 Pension Applications. Washington D.C.: National Archives. NARA Microfilm Publication M313, 102 rolls. Records of the Department of Veterans Affairs, Record Group Number 15. At ancestry.com, online search.ancestry.com, Cynthia D. Armstrong's widows application file - Soldier: John Armstrong; Widow: Cynthia D Armstrong; Marriage Date: 23 Jun 1808; Date Enlisted: 4 Aug 1814; Date Discharged: 17 Dec 1814; Soldier's Death Date: 23 May 1831; Soldier's Death Place: Culpeper County, Virginia; Widow's Death Date: 19 Mar 1874; Pension Number - #1: WC 605; Pension Number - #2: WC 605; Bounty Land Number - #1: 42646 80 50; Bounty Land Number - #2: 21862 80 55; Roll Number: 3; Archive Publication Number: M313. 1820 United States Census, Culpeper County, Virginia. John Armstrong household, 1820 United States Census, Culpeper County, Virginia, population schedule,Page: 194, Line Number 15 ,viewed on Ancestry.com. National Society Daughters Of The American Revolution Lee Line Capter, Tombstone Inscriptions and Burial Lots. United States, War of 1812 Index to Pension Application Files, 1812-1910 at FamilySearch., online https:/familysearch.org, Entry for John Armstrong - FamilySearch Ref: ARA Publication Number: M313; NARA Roll Number: 3; Film Number: 840433; Digital Folder Number: 4018210; Image Number: 00306.